Can Herald of Kozilek pay a Waste cost? Could you cast Warping Wail for free if you have two Voracious Readers in play? Put a 1/1 colourless Eldrazi Scion creature token onto the battlefield. It has "Sacrifice this creature: Add to your mana pool. Some new cards from the recent sets that are pretty great are Wilderness Reclamation , lets you have access to even more mana. Seedborn Muse is essentially a staple in these types of decks. Some interesting spells you can additionally run are cards like Warping Wail . 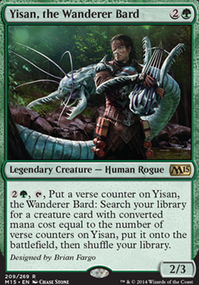 For card advantage you can also try use Rhystic Study or Mystic Remora , if you have the budget Sylvan Library is also a great engine. @Oloro_Magic I've been doing some updates to the copy version with all the info I've gotten from asking various questions on here as well as after talking to some friends. I really think that is the best version so far that I've had. I ended up taking Corrupted Crossroads out for Mana Confluence . I don't get the colorless but it really helps beef up my colored mana sources. This mana base seems to be the best so far too. 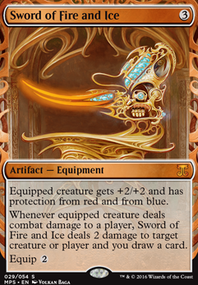 It's got 14 blue sources to help reach double blue to emerge EDF, it has 8 black sources to help cast dismember and things out of the board (10 if i'm casting Distended Mindbender , it has 8 red sources to cast Kozilek's Return out of the board, and still has 21 colorless sources. Also, it's not just that the gryff triggers sanctum to get EDF. I can go get EDF, Thought-knot, or smasher depending on the situation. The deck can also have explosive draws like T1 mimic, T2 thought-knot, T3 smasher which can deal 18 damage by turn 3. I like where the deck is situated at this moment. My lgs doesn't have a huge modern following so there isn't a ton of degenerate decks running around, just a bunch of people playing things they like or find interesting. The only thing I feel like may be out of place is Warping Wail . It may be better as Collective Brutality or something else that has utility. APPLE01DOJ on What should be changed?? Definitely run Expedition Map . I'd move Warping Wail to the SB and cut Eternal Scourge completely. I'd trim either 1x Sanctum of Ugin or 1x Unclaimed Territory . I'd also probably run Watery Grave over the basics and/or the U/B pain land over Unclaimed Territory . Karn Liberated is totally on my list to acquire. I will probably also re-add Warping Wail . The Grafted Exoskeleton I will have to think about a while. Our playgroup generally frowns on infect. This being said, I am not against the idea. Cutting Warping Wail . This card was just me trying to be cute but it isn’t good. 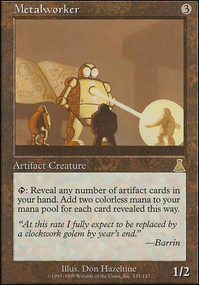 You have to hold up two mana per turn and it costs a card, which slows you down by a decent amount. If you fall behind your opponents, warping wail won’t help you catch up like Boros Charm or Scapegoat which both use the opponents’ wraths against them. This is why you always see Teferi's Protection in EDH but never Envelop . Bringing in Oathsworn Vampire . He is a lot like Bloodghast . Even when I can’t recast him he isn’t that much worse than some other 2 drops I run. I don’t run many lifegain enablers for him but I do run a lot of draw so I assume that every other game I will find an enabler and recast him. This means he will be pretty good on average.